The Drugstore Cowboy is a high adrenaline ride of two drug-addicted couples traveling in the Northwest. Set in 1971, the couples steal opiates from pharmacies to satisfy their base cravings. The dreary grey ambiance of Portland gives the film a restless and brooding appeal. The ringleader Bob, played by Matt Dillion, has a confident swagger and a no-holds-barred approach to life. Bob's dynamic interaction with his wife, played by Kelly Lynch, his buddy Rick (James Le Gros), and Rick's teenage girlfriend Nadine (Heather Graham), drives a compelling, us-against-the-world camaraderie. Eventually a terrible tragedy befalls Bob's band of miscreants. This epic event convinces Bob to go straight and give up drugs. Unfortunately, his Dionysian wife and a cameo by beatnik writer William S. Burroughs, makes his struggle for sobriety a difficult task. 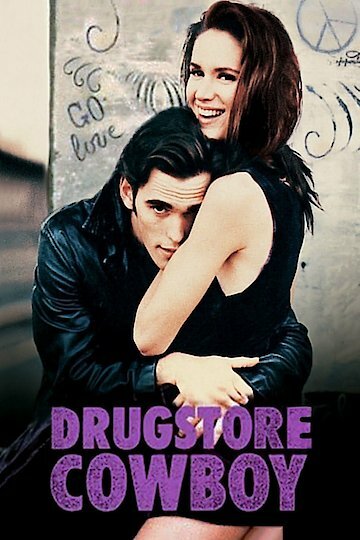 Drugstore Cowboy is currently available to watch free on The Roku Channel and stream, download, buy on demand at Amazon Prime, HBO NOW, Vudu, Google Play, YouTube VOD online.